If you created a palette in another project and you would like to import it in your current project, you can browse for the palette file on your computer and add it to your project. 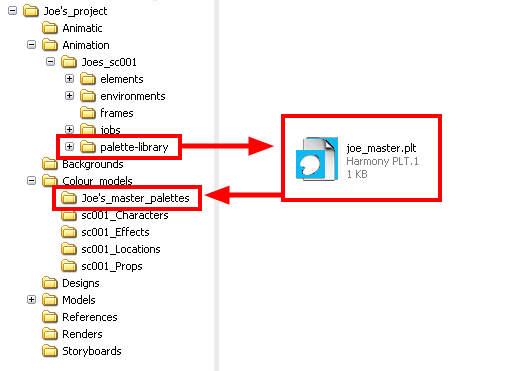 When the palette is imported in your scene, the file is copied in the project’s directory. It is not linked to the original file. 1. In the Colour View menu, select Palettes > Import or click on the Import Palette button. 2. Browse for a palette file located on your hard-drive. You will generally find the palettes in your projects’ Palette-Library directory. You may encounter a scene where only the colour palette created for a certain layer is visible when that layer is selected. A good example would be a scene where there is a character on one layer and the background on another and each has its own custom colour palette. 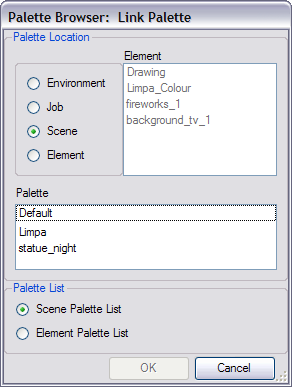 In order to see both colour palettes, independent of what element is selected, you must link your palette list to another palette file within the Harmony structure. 1. In the Colour View menu, select Palette > Link. The Palette Browser window opens. 3. 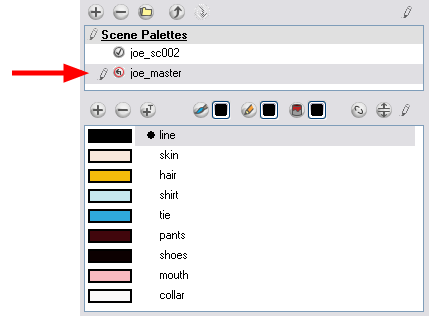 Select the Scene or Element Palette list. See Scene Palette List and Element Palette List topic for more information. See Scene Palette List and Element Palette List topic for more information. With Toon Boom Harmony as a stand-alone application, every scene is local to the machine. This means that all of the scene’s data is only accessible from that particular scene. Palettes are also local to the scene: they can be shared between all drawing layers, but not between scenes. However, some users may want to share their palettes across a whole project. Toon Boom Harmony offers that possibility. By default, a palette is an independent file stored in your Toon Boom Harmony scene. This file can be copied, moved or deleted. To fully link a palette throughout an entire project, you need to create a central directory where you can copy all of the palettes you have created. Every time you link a palette in an element, it is linked to this folder. If you modify the palette, it will be updated throughout the whole project. 1. In the Colour view, click on the Create Palette button to create your master palette. 2. Save your scene by selecting File > Save from the top menu or by clicking on the Save button or press [Ctrl] + [S] (Windows/Linux) or [⌘] + [S] (Mac OS X). 3. In your operating system, create a master directory. Ideally, this should be created in your Root folder to keep it within the project directory. You could also place it inside your Colour Model’s subdirectory. 4. 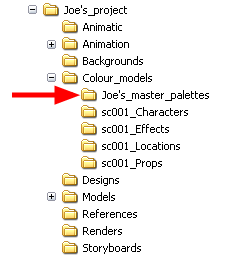 Name the folder appropriately, for example: Joe’s_master_palettes. 6. Select and copy your palette.plt file to copy it to the master palette directory. 9. 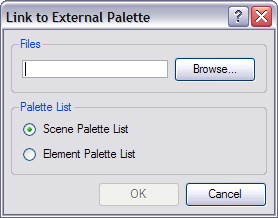 In the Colour View menu, select Palettes > Link to External. ‣ Files: Click on the button to browse to your master palettes folder and select the palette *.plt file you want to link. ‣ Palette List: Select either you want to load this palette at scene or element level. The linked palette appears in your Colour view. You will also notice that when you create or link a palette, a small icon will appear on its left. These icons represent the palette linkage status. • Indicates a potentially dangerous situation. • Indicates that the palette is safe. • Indicates that the palette file is stored in a directory external to the scene’s structure. • Indicates that a palette file stored in a level such as Element, Scene, Job or Environment is linked to a Palette list that is not on the same level.